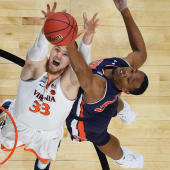 With more than 50 conference tournament games Thursday, and all the power conferences getting into full swing, there are plenty of bubble implications for the NCAA Tournament Selection Committee to gnaw on. We saw Michigan State probably play its way in while Cal kept its hopes alive. Xavier also picked up a big win over Butler, its first over one of the other top six teams in the Big East since winning at Creighton on February 4th. That locks up a spot for Xavier in the event it had not been locked up already. Marquette finishes the season with a record of 19-12 after a loss to Seton Hall in the Big East quarterfinals. The Golden Eagles should still be OK for a bid to the NCAA Tournament. Marquette has eight top 50 wins, only half of which came at home. They have a couple of bad losses, but that should not be enough to leave them out. Iowa probably saw its bubble popped today after a loss to Indiana. The Hawkeyes fell to 18-14 on the season, and despite some good wins, they just have too many negatives to expect to get in. Their profile is basically the same as Syracuseâs, except slightly better because of a couple of quality road wins. The Illini saw their NCAA Tournament hopes dashed with a blowout loss to Michigan in the second round of the Big Ten Tournament. Illinois finishes the season 17-14, and they did not do nearly enough to become get an at-large bid with the second-worst record ever. The Spartans have likely punched their ticket for the NCAA Tournament with a win over Penn State in the Big Ten Tournament on Thursday. MSU played a strong schedule, and while they do not have an inordinate amount of good wins, they have plenty. What was important today was that the Spartans showed that they could play quality basketball away from home, which was in doubt for this team. Cal picked up a huge win and actually resembled an NCAA Tournament team for the first time in a couple of weeks. The Bears will get a shot at Oregon and a shot to get safely into the field. Vandy pounded the Aggies to move to 18-14 on the season. That gives the Commodores a chance for yet one more win over Florida. That seems like a minimum for a chance to be an at-large team in the NCAA Tournament. If the Blue Raiders are going to be an at-large team, it will mean taking a bad loss in the conference tournament. They need to lose to the best team possible. That is not UTSA. Nevada needs to get to the conference tournament final because a loss to anyone other than Colorado State or Boise State will not be good enough. The Wolf Pack took one step in that direction on Thursday. The Wildcats are among the last four in because of a poor record against better teams and a poor non-conference schedule. They may not have a lot of good wins, but the good ones are pretty good -- at Baylor and Oklahoma State and home vs. West Virginia. The Friars are in pretty good shape even with this loss. The biggest problem with their tournament resume is bad losses, and obviously, Creighton doesnât fit that bill. The Friarsâ resume is not the strongest, but likely be good enough to make this field. The Rams have been pretty good at home, but they have a couple of bad losses away from home, including a loss at Fordham and a blowout to Illinois. They fought back to make the game at Dayton close, but could not get over the hump. VCU needs a deep A-10 tournament run just to avoid another bad loss. Arkansas was in serious trouble following a loss at Missouri and a big home loss to Vandy. The Hogs came back to life with a win at South Carolina, their first over a likely tournament team, during a stretch of six wins in seven games. Arkansas should be OK if it can avoid a bad loss. An ACC tournament loss to Virginia Tech leaves Wake looking at a nervous Selection Sunday. But no bubble team had a better final week of the regular season, beating Louisville and winning at Virginia Tech. That filled a couple of big holes on its NCAA resume. The Rams have four top 100 wins after a much needed win over VCU at home. Now, the Rams need to avoid giving that away, which they tried to do against Davidson. Rhode Island has two bad losses at home (La Salle, Fordham) and nothing but potential bad losses left on its schedule until deep into the Atlantic 10 tournament. The Commodores definitely have some nice wins, including a sweep of Florida, but if they donât beat the Gators again in the SEC tournament, the Commodores wonât even be four games above .500. Historically speaking, that is the minimum mark to get an at-large bid. The Redbirds won a share of the Missouri Valley title, which in most years would be enough for an at-large bid, if necessary. That is not the case this year, with the league at its lowest point in more than a decade. Illinois State has only two top 100 wins, which usually is not enough. They also have a couple bad losses, including a real clunker at Murray State. In 2013, the Raiders became one of the least deserving teams to ever receive an at-large bid, with only one RPI top 100 win. They are already in better shape now, with four. Two of them are over other non-major conference leaders and none over likely at-large teams. They also have a home loss to Tennessee State and at real clunker at UTEP. There is little margin for error playing a C-USA schedule. Nevada won the Mountain West regular-season title and has five top 100 wins, but has not beaten a sure tournament team. In fact, they have played only one and got blown out at St. Maryâs. The Wolf Pack already has a handful of bad losses, and that may be too many, so they cannot take another one. The Orange have a nice wins against top 50 teams - all at home -- including Florida State, Duke and Virginia. However, the rest of the season was not good, and that is reflected in their RPI, which is now in the mid-80s. That would be the worst RPI ever for a tournament team. They also are only 2-11 away from home, which would be the worst ever for a tournament team. And, finally, the Orange have five bad losses, which would be one short of the record for a tournament team. A team with six top 50 wins gets left out almost every year. No team with their negatives ever gets in.